smooth wall surface without punching, providing a powerful home care and Security guarantee for your child and family. 1. Open the box and remove the handle to make sure the wall is smooth. 2.place handle on the surface and push the safety locking switch in just seconds,no need to drill holes in walls or tiles. 1.movable and detachable with flip-up tabs for perfect installation. 2. Balance assist bar for all the family. 3. Easy installation. No tools needed. 1. length:11.8 x 3.9 x 2.4 inches. Function: it can effectively provide safe grip for children, the elderly, and people with disabilities, even when they are in the bath, or around the bathroom, even the smooth ground. At the same time it can carry heavy loads. High quality: This shower grab bar is made of durable ABS and ribbed-grip handles,Sturdy and Durable suction pads. 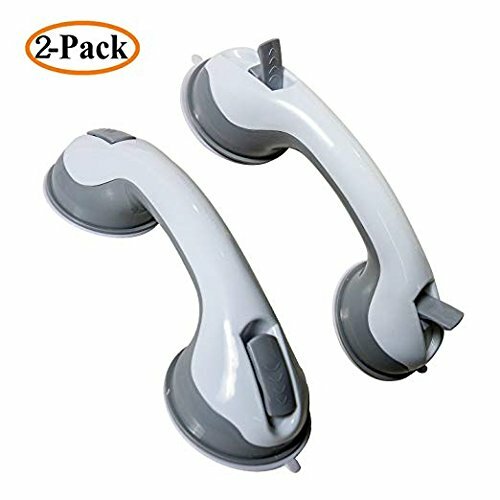 Two powerful suction grips provide sturdy support when you get in and out of the tub. Easy installation ,just place it on the surface and push the safety locking switch in just seconds, no need to drill holes in walls or tiles. Convenience: It is compact and effortlessly removed, just unlock the switches and move it to a new location. When you travel, you can remove it and put it in your travel suitcase, which is very convenient. Notice: The handle must be used on a dry, flat surface and also tile, glass can be used. Check for firmness after each use. Because of the atmospheric pressure principle, it is best to test it several times without being able to adsorb it. Guarantee:we are providing one and two choices, for some reason, we can't guarantee that you are 100% satisfied with this product, we are willing to accept refunds 100% guarantee refund policy., if there is doubt, you can contact us at any time. If you have any questions about this product by SEEWW, contact us by completing and submitting the form below. If you are looking for a specif part number, please include it with your message.